Arvind Kejriwal's AAP is hoping to expand its base in Punjab and Goa. The counting of votes was yet to start - but the Aam Aadmi Party is celebrating. 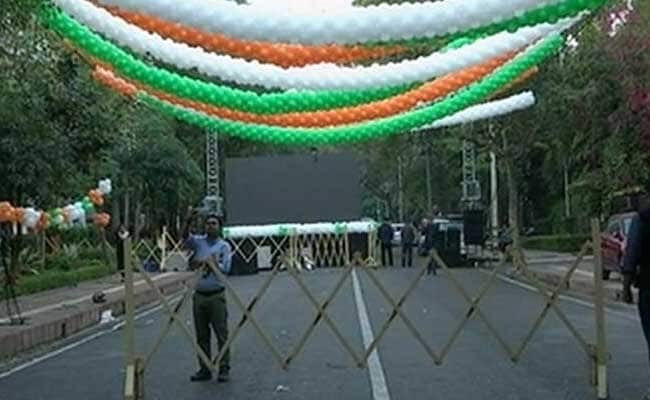 Since dawn, several hours before the counting started, the area outside party chief and Chief Minister Arvind Kejriwal's home in Delhi was seen decorated with balloons in saffron, white and green and a number of party flags. A giant television screen had the pride of the place and composer AR Rahman's hugely popular "Jai Ho" - the theme from "Slumdog Millionaire" that played at the Oscar ceremony -- is blaring on loudspeakers. The chief minister himself skipped his usual morning walk today to monitor the election results. After its sweep in Delhi assembly elections, AAP has chosen Goa and Punjab to expand its footprint. Most exit polls, while predicting a dismal showing in Goa, have placed it neck and neck with the Congress in Punjab. Two exit polls have predicted that the Congress will win, the other showed AAP was ahead in Punjab. Two others said that the parties will be neck-and-neck. The aggregate has put the Congress ahead only by two seats and predicted a hung assembly in the state. AAP is confident of bagging over 90 seats. Its tallest leader in Punjab, 44-year-old Bhagwant Mann, has made a bold prediction, saying the party will win more than 100 of Punjab's 117 assembly seats. Today, the party's senior leader Ashish Kheta said there is a "deep sense of dejection" in both the traditional parties in Punjab. AAP's Ashutosh said "No support will be given or taken by the party in Punjab. AAP will only form government on its own or not". Former cricketer Navjot Singh Sidhu, who joined the Congress days before the Punjab assembly elections, has said the party will get around 40 seats. Chief Minister Parkash Singh Badal claimed the Akali-BJP alliance will win 72 seats.